I tried to understand the new crisis in Qatari-Saudi relations, which is also one in Qatari-Gulf relations. Based on a logical calculation, Qatar has an interest in being a natural and effective member of the Gulf Cooperation Council. Developments over the past two years have suggested that the country has reconsidered policies based on the endorsement of disputes, trouble-making and moving against the current. It is not surprising to see a state seeking to expand and promote its role, especially if it has a strong media and finances that allow it to influence stances, countries and the public opinion. States can sometimes resemble individuals to a large extent. They get caught up by dreams to an extent that they may fall into illusions. They become attached to the major role that they are playing, even if the circumstances of such a role changed. Since the present cannot be separated from the recent past, I decided to skim through my papers and review what I heard or published. When the revolution broke out in Libya, I was engaged, as a journalist, in collecting stories on the long era of Maammar Gadhafi, and met a number of people who accompanied him from the early beginnings until the outbreak of the conflict, whether in his tent, his government, or in the Libyan Revolutionary Command Council. The following are excerpts from a long interview that I conducted in February 2014 with former Libyan Prime Minister Mahmoud Jibril, which was published in sequences in “Al-Hayat” newspaper. Jibril said that Qatar, which provided the Libyan revolution with cash and weapons, has been betting from the beginning on political Islam and has exerted exceptional efforts to appoint Abdul Hakim Belhaj as the commander of Libyan revolutionists. Belhaj is the former “emir” of the Libyan Islamic militant group. He has fought in Afghanistan and was arrested by the Americans, who handed him over to Gadhafi. He remained in jail until 2010. Jibril stressed that Qatar has intentionally delayed the eruption of the revolution in Tripoli to wait for Belhaj’s arrival to the Libyan capital in order to be crowned as the coup leader. The former prime minister added that he had to leave a bilateral meeting with then Qatari Crown Prince Sheikh Tamim, because the latter was too busy watching the arrival of Belhaj to Bab al-Azizia barracks in Tripoli, which was broadcast by “Al-Jazeera”. Jibril also recounted a very significant story. He said that a friends of Libya conference was held in Paris in September 2011. The meeting ended with a joint press conference, with the participation of Nicolas Sarkozy, David Cameron, Sheikh Hamad bin Khalifa, Jibril and Mustafa Abdel Jalil. The following is another important issue. In the last week of March 2009, I conducted an interview with President Ali Abdullah Saleh, two days before his departure to Doha to participate in the Arab Summit. 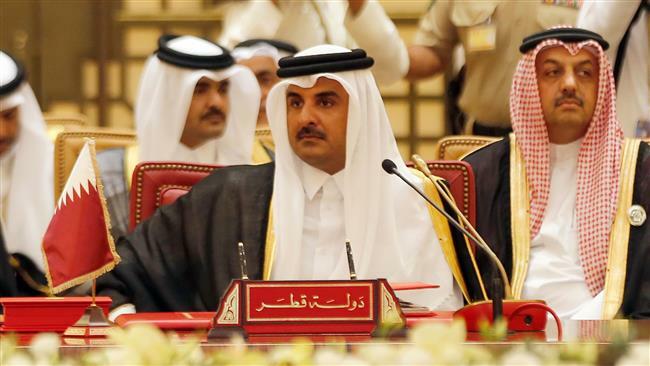 Circumstances that allowed Qatar to assume the abovementioned role have changed. This role is no longer possible. The Syrian war is raging, along with tensions between the Sunnis and the Shi’ites. Donald Trump’s America is not similar to Barack Obama’s America. Its priorities in the region are widely different. Trump’s speech in Riyadh is different from Obama’s address in Cairo. Washington is no longer counting on containing al-Qaeda by facilitating the arrival of “moderate Islamists” to power. “The Brotherhood” is no longer a possible of acceptable choice. Qatar is no longer able to have a mediatory role in this regard. The Trump Administration’s stance towards Iran is also clear. It does not consider the nuclear deal with Tehran as an exceptional US gain. The Trump Administration calls for isolating Iran and condemns its policies in the region, in particular in Iraq, Syria, Lebanon and Yemen. In order to accept the “Russia solution” in Syria, the US requires Moscow to curb Iran’s influence and to end the role of Iranian-backed militias. In this context, there is no room for a Qatari mediation. The regional landscape has changed. The summits held in Riyadh have highlighted the stance of the Arab and Muslim majority towards terrorism, extremism and Iran’s destabilizing policies. Saudi-US relations have taken a new different path. Egypt has changed, as well as Yemen. It is not easy for a country to accept that what was achievable before is no longer possible now. Its stubbornness reminds us sometimes of a person’s attachment to an old photo. What is certain is that Qatar’s relations with its natural environment will never be normal and stable again, unless the Arab state thoroughly reconsiders its stances and acknowledges that its old role has become unachievable and that it has a real interest to return to the limits of a normal role in the region.